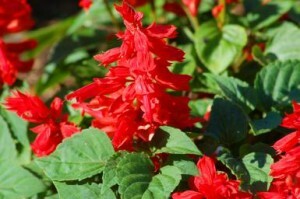 Growing fall flowers in the garden will enhance landscaping that is already graced by fall foliage trees. But if your landscaping lacks such trees altogether, planting fall flowers takes on even greater importance. The color display put on by these annuals and perennials will supplement the non-living autumn decorations in your yard, be they carved pumpkins and cornstalks, witches andscarecrows, or the few outdoor decorations geared to Thanksgiving. But exactly when should you be planting fall flowers? You certainly shouldn’t wait for autumn, itself, unless you live in a warm climate. Doing so would minimize your enjoyment of them. On the other hand, even in the North it’s usually too hot to plant through the first part of August. So the window of opportunity for planting can be quite small. Making matters worse is the fact that there’s no set date I can give you for planting, even for particular regions. Rather, it’s something that has to be played by ear. Some summers, a rainy period arrives in mid-to-late August, providing the perfect opportunity for planting. Other summers, a late August planting would still subject your transplants to excessive heat-stress, and it would be better to wait until early September. Further complicating the issue is the question of availability. As the summer wears on, fewer and fewer garden centers will be carrying your favorite annuals. That is why I advise you to buy the annuals that best fit your desired landscape color schemes no later than early August, while they are still in stock. Many homeowners think that planting fall flowers necessarily means limiting yourself to hardy species — plants that will survive the first frost. Such hardy plants are, indeed, useful. In the following pages I mention mums, ornamental kale, flowering cabbages and dusty miller, for instance, all of which will provide the landscape with color well after frosty weather arrives; another good choice is Montauk daisies. Perhaps you’ve wondered what the difference is between flowering kale and flowering cabbage. They’re both considered Brassica oleracea. And in both cases, the “flowering” in the name is something of a misnomer, since the pretty color you’re seeing is not a blossom, but rather in the foliage. The wonderful thing about flowering kale and flowering cabbage is their cold hardiness. This trait renders them a perfect substitute for real flowers after the latter have been killed by the frost. In fact, they may still be providing the landscape with color after your painted pumpkin face has succumbed to the cold — or to rodents. Flowering kale and flowering cabbage are thus integral components of a landscaping plan designed for optimal enjoyment over the longest possible period of time. But don’t be afraid to mix in some tender annuals, too. Their contribution will be brief, but spectacular. Marigolds are a good example, because they bloom in the classic autumn colors: orange, yellow, gold, etc. The two most common groups of marigolds are the French marigolds(Tagetes patula) and the African marigolds (Tagetes erecta). In each case the common names are certainly misnomers, as the marigolds are New World plants, native mainly to Central and South America. Just another example of why we use scientific names when referring to plants. From a financial perspective, you may be questioning the wisdom of planting such tender plants as marigolds as fall flowers. Isn’t it a waste of money to plant something that will be dead in a few weeks? It would be a waste of money, if you were getting them at springtime prices. But I’m referring to annuals that can be gotten inexpensively, due to the lateness of the growing season. Cheap flowers can be found in July and August. By slashing prices after “prime time” for annuals, garden centers try to unload leggy annuals that they could not sell in spring; ideally, they like to move these cheap flowers by July. But others grow or buy in fresh recruits and continue to carry an inventory of cheap flowers during August. The cheap flowers in the “leggy group” may not look like much when you buy them, because they have been sitting in nursery flats for too long. But they are still a great bargain, because they can be revived — provided you follow a few simple principles of container gardening. Check the undersides of the leaves first, though, to make sure they are bug-free. A bug-laden plant is no bargain, no matter how cheap it is. It is too hot to plant these flowers in July, but that shouldn’t stop the frugal landscaper from buying them. Go ahead and purchase the annuals, but do not plant them in the ground yet. Instead, transplant them into containers. Container gardening means mobile gardening. Containers can be moved in and out of the sun, based on how your annual is holding up to the summer heat. You simply do not have this flexibility with annuals planted in the ground. The containers do not have to be anything fancy, since your aim at this point is not to display the flowers. Rather, you are just looking to nurse them back to health. So a suitable vessel for such container gardening can range from a wooden box to that poinsettia pot you threw behind the garage after last Christmas. Just make sure that you disinfect any container you want to use first, and drill drainage holes in it if the container does not already have such holes. When you knock the annuals out of their flats, check the rootball. If it is wall-to-wall roots, forming such a dense mat of roots that soil is not dislodged even when you squeeze the rootball, then you have a root-bound plant. You would not think, perhaps, that there could be such a thing as too much root growth. But when roots have been growing in cramped quarters for too long, their growth becomes deformed. Instead of branching out in a healthy pattern, they start to grow in on themselves, forming a dense mat that is unhealthy for the plant. All is not lost, though. Before transplanting a root-bound plant, just break up that dense mat of roots, by scoring all around the rootball with scissors or a knife. It seems harsh; but this is a case where a little corrective surgery can do wonders. Also, many annuals respond favorably to a good “haircut.” You can revitalize everything from alyssum to petunias by simply taking a pair of scissors and removing the top 1/2 or so of the current growth — stems, leaves and flowers. In fact, this step is almost mandatory if your annuals are leggy. During August you can nurse along your bargain-basement annuals, getting them ready for fall planting. When temperatures cool later in the month or in September, transplant your annuals out of their containers and into the ground for an eye-catching display of fall flowers. The “brown thumbs” among you will be glad to hear that there’s another way to provide yourself with seedlings for a fall planting. Some retail outlets, as noted above, call in fresh recruits (seedlings started in summer) to put on sale as the dog days of August are waning. These plants are just starting out in life, so their foliage will still look nice and fresh by the time they bloom in fall — without any nursing from you. You may pay a bit more for them than for the older, leggy plants; but they are still often sold at a discount, due to lack of consumer interest in annuals so late in the season. Either way, the beauty of purchasing cheap flowers for fall is that you can thumb your nose at Jack Frost. Let the frosts come when they may; you have little to lose, since your investment was minimal. But which annual and perennial flowers are best for a fall color display? And how should they be arranged? One way to begin discussing the use of autumn flowers in landscaping front yards will be in the context of a short introduction to landscape design. While color schemes immediately come to mind, especially when landscaping front yards for fall, color is but one of the five basic elements of landscape design. Let us look at two of those other elements to see how they can be utilized to enhance your front yard landscaping: namely, texture and form. And if, when purchasing your autumn flowers, you make your selections with an eye to achieving contrast (either in form, texture, or both ), your front yard landscaping will have neighbors convinced that you are a real pro at landscape design. “Form” roughly corresponds to the shape of a plant. Visual interest can be achieved in landscape design by utilizing contrasting shapes. For example, a mound-shaped plant like Silver Mound artemisia (Artemisia schmidtiana ‘Silver Mound’), a perennial as far north as planting zone 4, provides a wonderful counterpoint to a spiky plant such as dracena, aptly nicknamed, “spikes” (Dracaena indivisa). Both artemisia and dracaena are grown for foliage, not blooms; so add some autumn flowers to such a planting to inject color. For the element of form cannot be completely separated from that of texture. Despite the implied reference to tactility, texture is mainly a visual matter in landscape design theory. It is dependent upon the form of the blooms of a plant, or, especially, its leaves. Furthermore, texture is contextual; that is, speaking of the texture of a plant in isolation makes little sense — a context must be provided. We draw conclusions about plant texture based on how it compares or contrasts with the plants around it, either in terms of size or form. The texture of the leaves of Silver Dust dusty miller (Senecio cineraria), for example, with its deep indentations along the edges, contrasts strikingly with an adjacent plant whose leaves have smoother edges, such as red salvia, also known as “scarlet sage” (Salvia splendens ‘Red Hussar’). The former is perceived as having a more delicate texture. Likewise, visual interest is provided by the juxtaposition of a relatively small-leafed, more delicate plant, such as chrysanthemums (the hardiest will overwinter in planting zone 5), with a plant bearing larger leaves, such as the coarse-looking ornamental kales and flowering cabbages, both of which, in terms of plant taxonomy, are considered to be Brassica oleracea. Chrysanthemums are one of the most popular autumn flowers. As you will readily see from the above observations, the elements of form and texture have much to contribute to landscape design. But while there is more to landscape design with autumn flowers than just color selection, the element of color does, of course, play a large role. Indeed, none of the foregoing remarks concerning the role of form and texture in landscape design are intended to minimize the importance of providing fall colors for the autumn landscape. And most people have specific colors in mind when planning a fall color scheme for their perennial or annual flower gardens in fall. The classic fall color scheme of red-yellow-orange makes for a powerful celebration of the harvest season. Orange and yellow nasturtiums (Tropaeolum majus), lemon yellow French marigolds (Tagetes patula ‘Lemon Drop’) and reddish-purple plumed celosia (Celosia argentea var. cristata), for example, will set your annual flower gardens ablaze in autumn splendor. A metallic color scheme is also popular in fall landscape design: golds, silvers and bronzes. For example, golden African marigolds (Tagetes erecta ‘F1 Gold Galore’) , Silver King artemisia (Artemisia ludoviciana ‘Silver King,’ a perennial to zone 5), and a bronze coleus (Coleus x hybridus) work well together. But not everyone favors these traditional fall color schemes. Some prefer the pinkish-purple chrysanthemums over other colors, and another perennial, the purple New England aster (Aster novae-angliae), is popular for fall planting. If your tastes are a bit more eccentric, or if you need a taller specimen, inquire at local garden centers about the availability of a red to reddish-purple annual fancifully known as, “love-lies-bleeding” (Amaranthus caudatus). Regardless of the color scheme you choose for your landscape design, do not forget to include fall flowers when landscaping your front yards in fall. Northern landscapers, in particular, should heed this reminder. Winter will bring its silence soon enough; let the landscape sing the praises of summer one more time. It will be your last opportunity until spring.